Lori Freedman is a member of the international group of people currently named “the renaissance musicians”. Freedman’s artistic practice spans the gamut. 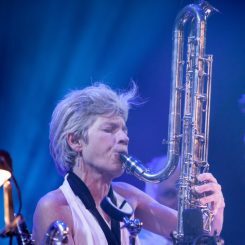 With full throttle in both contemporary and improvised music streams she is known internationally for her provocative and creative performances. As an interpreter of written music for clarinet hundreds of works have been dedicated to and/or premiered by her. While managing a full performance schedule (more than 75 public appearances a year), making recordings, touring and leading workshops, Freedman has also been receiving commissions to write music for an eclectic group of artists: Arraymusic, Transmission Ensemble, Continuum Ensemble, Ensemble Supermusique, Upstream Orchestra, NOW Orchestra, Orkestra Futura, Ggril Ensemble, Queen Mab Trio, Crowbar Trio, Lott Dance, Oberlander Films, Foresite Theatre, Cooke Productions and Autumn Leaf Productions. Her solo works have been presented internationally (Croatia, Romania, Austria, Germany, Hungary, Cyprus, France, Holland, USA) and she has received various performance invitations from organizations such as the Huddersfield Festival (UK), the International Society of Contemporary Music, the Gaudeamus Festival (Holland), The Loft (Germany), Radio France, Les Nouvelles Flâneries de Reims and Théâtre Garonne (France), Rai Radio (Italy) Roulette and The Stone (NY). In 2017 she was elected to be Fellow of the Royal Society of Canada, twenty years after receiving the 1998 Freddie Stone Award for the “demonstration of outstanding leadership, integrity and excellence in the area of contemporary music and jazz.” Highlight collaborations have been with Joëlle Léandre, Mauricio Kagel, Rohan de Saram, Frances-Marie Uitti, Philippe Leroux, Jack Quartet, George Lewis, Helmut Lachenmann and Richard Barrett. Her most recent feature recordings include ON NO (moderecords), Bridge (CQB/DAME), Plumb (Barnyard Records), 3 and À un moment donné (Ambiances Magnétiques), Huskless! (Artifact), See Saw and Thin Air (Wig).« Quite simply, Lori Freedman is a rare musician of true genius… the extraordinary art of this monumental musician. » (Roger Woodward, Australian pianist) « Lori Freedman is the best thing that has happened to new music – she is a fantastic musician » (John Corigliano, New York).